• You are in the military and your military state of record is Nevada. In this case we would need a copy of your LES. There are a number of reasons which qualify you for a Nevada fast Annulment. We include 35 reasons in Nevada Qualifications. Since these actions are somewhat complicated, you may wish to call us at 1-888-326-8876 for a FREE CASE ANALYSIS. • a marriage based on some kind of dishonesty. Dishonesty generally involves one party misrepresenting some important fact to the other party, and that other party having relied on that misrepresentation as a basis for the marriage. To file an action based on dishonesty, you must have separated from your spouse shortly after learning of the dishonesty. NRS 124.340. Cost - $400 for our Nevada Annulment services plus a court filing/handling fee $325. This court normally will sign the annulment in about a week after filing. Nevada Annulment papers can normally be typed and e-mailed to you the same day. Nevada Annulment - Joint Petition $400 Start Now! You may apply for an annulment even if the other party is not willing to sign or cannot be located. Cost - $500 for our Nevada Annulment services plus a court filing/handling fee $325 and personal service of approximately $100. If the other party cannot be located and served, a due diligent search must be done which is $125, and minimum publication cost of $150. This annulment takes about 6 weeks if the other party can be served or about 12 weeks for the case has to be published. Nevada Annulment - Complaint $500 Start Now! If the parties were not married in Nevada, one (1) party must be a resident and pysically present in Nevada for a period of six weeks and has the intention of remaining in Nevada indefinitely. To prove your residency we type a Resident Witness Affidavit that another resident signs stating that he/she has seen you living in Nevada for 6 weeks. The witness must be at least 18 years of age who has lived in Nevada for at least the past six (6) months. If you are currently in the military and your military home state (state of record) is Nevada, you may file for an annulment or divorce even if you now reside in another state or country. If you choose Nevada Divorce for your annulment there is never a hearing required with the court systems we use for joint petitions. Other companies may require hearings and personal appearances. 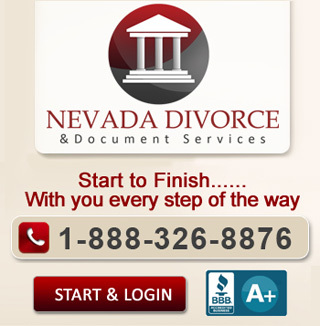 Use Nevada Divorce's services with a peace of mind guarantee. We guarantee 100% Court Approval with properly signed documents, unless it is a complaint action and the Defendant contests. Read more in Our Guarantee. What are reasons for Nevada Annulment? There are 3 categories for Nevada annulments; a marriage that was void at the time performed (such as blood relatives, bigamy), a marriage that lacked consent (such as intoxication, insanity, underage), or a marriage based on some kind of dishonesty. Under fraud the state requires immediate separation upon learning of fraud. Also see our webpage on grounds for annulment. How is an Nevada annulment different from a divorce? An Annulment cancels or voids marriage as though it never occurred. Is there any time limitation as to when you must file for an Nevada annulment? There are no time limitations in Nevada; however, we encourage clients to file as soon as possible as it may affect the Judge’s decision. In addition, if you are using the fraud statutes the state requires immediate separation upon learning of the fraud. What documents should I include? You should include any documents you have to substantiate your grounds for annulment, such as: Proof of different addresses, infertility, mental illness, disease, bigamy, (or other reason they are using) and the marriage certificate. If you do not have the We need to file the marriage certificate if married in Nevada and you don't live here.